This is a picture of the shoes I wore one day last summer. I wore them to daycare drop-off, the post office and to work before I realized what you already know. These shoes do not match. They are neither the same color nor (harder to see from this picture) the same height. I got out of my car at the office, looked down, and all I could do was laugh. This image is probably the perfect reflection of my life. 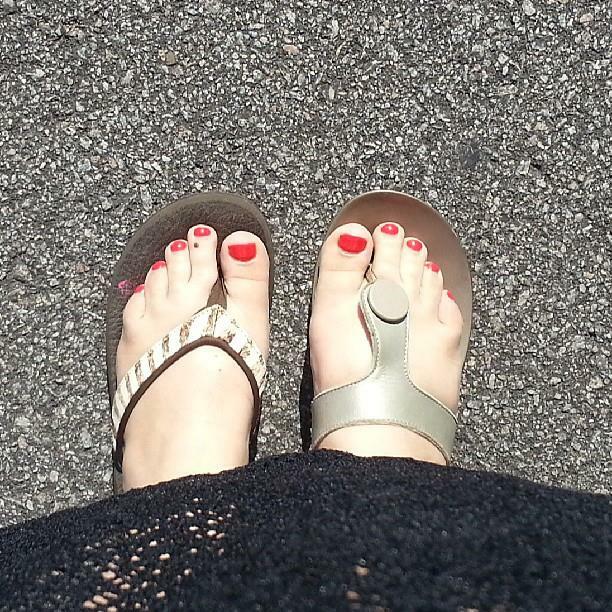 I am a disorganized, discombobulated, red-toe-nail mess most of the time. My car is covered in goldfish and spreadsheets. My bedroom has piles of clothes, baby dolls, and magazines I once read. It is not pretty, but it is the best I can do right now. And I have made a decision. I have decided to embrace the chaos. I am not going to embrace the chaos because I love dirty bathrooms or a refrigerator filled with science projects that used to be leftovers. I am embracing the chaos because one day my sweet husband and I will sit in our very tidy house and laugh about the crazy days of babies. I work outside of the home full time. That translates to approximately 6 hours of awake time each day with my babies, 5 days a week, which leaves me 30 hours total time, at best. 30 hours….If I harp on that too long, I could weep. But I like my job and it is right for my family right now So instead, I want to focus on how I am going to spend those 6 hours. Please know that I mean how to realistically spend that time. Those hours are not always pleasant. It is the witching hour, dinner time, bath time and all around grumpy-end-of-day time. The point is this – I am going to try to embrace the chaos. Some days I want to cry because I want a cleaner house, a deliciously full pantry and some serenity with candles that smell like they are heaven sent. But most days my goal is to accept the dog hair making tiny tumble weeds in some corners of my house because that dog is gentle and sweet and loved by my babies. I try daily to ignore the “to-do” list that beckons to me and know that it will get done….eventually. Maybe if we were all embracing the chaos, we might find some peace there. Maybe your chaos does not present itself in the same way mine does. Maybe your house is not a mess, your hair is perfectly coiffed, but your mind is always racing with chaos. However it may manifest itself, I say let’s try to embrace the chaos, have some fun, and dance in mismatched shoes while we have the chance. This entry was posted in Advice, Family, Lara Winburn, Parenting, Women and tagged Columbia, columbia sc, every woman blog, Famously Hot, hospital blog, Lara Winburn, Lexington, lexington medical center., lexington sc, Lexington Women, lmc, LMC every woman blogger, Midlands, Midlands Women, organization, South Carolina, South Carolina Women, Women, women's blog, women's hospital blog by Kate Gillmer. Bookmark the permalink.